No one knows for sure. One story credits its discovery to a chemist of the Cali cartel. An early epidemic of crack use occurred in the Bahamas from 1980; Bahamian hospital psychiatry departments recorded a surge of admissions from severely disturbed and psychotic users. 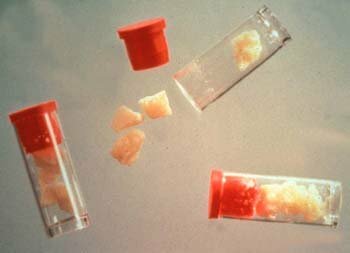 In 1983, crack use filtered across the Florida Straits. It took hold in Miami, followed by New York. The first newspaper report of the phenomenon appeared in the Los Angeles Times in 1984, Within a year, crack use had swept across inner city ghettoes throughout America. The first "crack babies" were born. Crack is actually a less pure variety of free-base cocaine. Unlike old-fashioned free-base, however, its production doesn't involve any flammable solvents. Unlike the hydrochloride salt, free base cocaine vaporises at a low temperature. This makes it suitable for smoking. Crack is usually made by mixing two parts of cocaine hydrochyloride with one part baking soda (sodium bicarbonate: NaHC03) in about 20 ml of water. The solution is then heated gently until white precipitates form. Heating is halted when precipitation stops. The precipitate is filtered and retained. The precipitate may then be washed with water; this procedure is usually omitted in the street product. The product may then be dried for 24 hours under a heat-lamp. Crack is then cut or broken into small 'rocks' weighing a few tenths of a gram. The traditional method of taking cocaine in the West involves snorting the hydrochloride salt. But absorption through the nasal mucosa is relatively modest. This is because their surface-area is small and cocaine is vasoconstrictive. Classic freebase, on the other hand, is smoked and inhaled directly into the lungs. Therefore much higher doses are possible. Inhalation is followed by an intense euphoric rush. The euphoria doesn't last long. The user becomes irritable and craves more of the drug. Chronic cocaine-use causes a decrease in the production of enkephalin, one of the brain's natural opioids. This in turn causes a compensatory increase in the number of mu-receptors. The number of unoccupied mu-receptors may be associated with the craving and abstinence syndrome. After chronic exposure to cocaine, the number of post-synaptic dopamine receptors in the CNS is reduced. The amount of dopamine transporter protein is increased. Tolerance to cocaine's effects does exist over prolonged use; but the extent of this physiological adaptation is relatively modest. 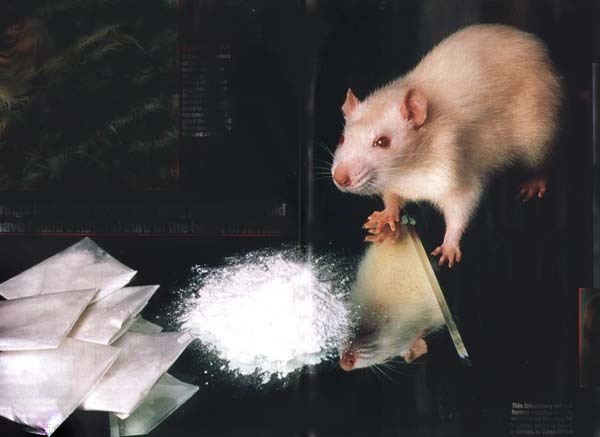 The cocaine-user still gets high; but in the absence of cocaine, his pre-synaptic neurons sequester dopamine in the synaptic cleft with greater efficiency. This may induce depression, and sometimes profound despair. No one ever feels contented after taking cocaine. They just want more.